I have been watching a pair of Northern Cardinals in my front yard for a few weeks now. Over time, I began to realize that if I saw one of them that the other would not be far away. 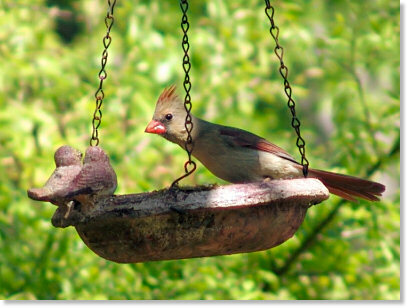 From what I have read, it appears that Northern Cardinals mate for life and both help care for their babies, so it isn’t surprising that I tend to find them together. Listening to them sing together in an almost humanlike manner, fascinates me. The male Northern Cardinal is known to be pretty territorial and will try to chase off other male birds coming into the area. I have noticed that this one isn’t too crazy about squirrels around either, but he sure doesn’t have any qualms about stealing the squirrel food when other birds are occupying the feeders. Of course, this doesn’t make the squirrels any too happy, but watching them fuss at each other brings a smile to my face every time! After a ton of trial and error, I have come to the conclusion that photographing Northern Cardinals takes perfect timing and a ton of patience. Even the slightest unexpected movement sends them flying off in another direction all together. I would love to be able to get a picture of the two of them together, but the male cardinal has proven to be a bit camera shy and hasn’t given me a clear shot of him yet. His warning call to the female Cardinal, whenever I am moving about has made it difficult to get more than a quick occasional photo of her. To increase my chances of getting a good picture, I set up a tripod on the porch a few days ahead of time so they would get used to it being around. Then one morning I went ahead and set the camera in it, and hooked up the remote control. Once I was sure I was focused well on the area, I was able to sit nearby and wait for one of them to land in the feeder. Using this method, I could take several pictures in a row without startling the cardinals because the only movement I needed was the slight movement of my thumb activating the remote. This technique has not yet been successful for getting a good photo of the male cardinal. No matter which bird feeder I have the camera focused on, it is almost as if he knows and he chooses a different feeder to land on. Patience is definitely the key to this photography tip! Eventually the timing is going to be perfect and I will be able to add his photograph to this article. Very nice photo.First of all lemme congratulate you for your patience.I have also been trying to take a picture of the male cardinal which is very difficult as u said.They sit on a tree right outside my balcony.Unlike you i dont have a lot of bird feeders.I have only one hung in my balcony and no visitors yet.I was just googling for some techniques to photograph the cardinal and then i stumbled upon your blog.Just wanted to say the photo is really nice.Goodluck on the male cardinal.